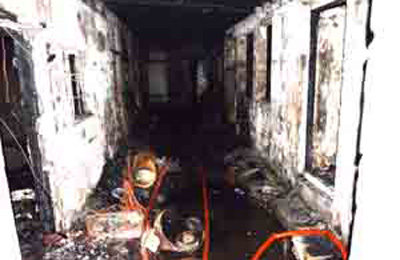 The gutted interior of the building in which three workers died. Authorities have blamed workers for putting their own lives at risk by living in 'rogue' labour accommodations. Workers often live in dilapidated structures registered as residential buildings which make it difficult for inspectors to search the facilities for safety violations, said Labour Ministry Under-Secretary Sabah Al Dossary yesterday in a report in the Gulf Daily News (GDN), our sister publication. He said investigations into last Friday's deadly blaze revealed that the two-storey building in Mukharqa was an "unregistered" labour camp. The fire killed three Bangladeshis and forced close to 80 tenants to flee for their lives. One of the workers was Dulal Siddiqur Rahman, 32, who was killed along with his brother-in-law and cousin. They have been identified as Mosharraf Hossain, 33, and Jalal Gafur Miah, 28. Civil Defence officials said the fire which started on the first floor was caused by "safety negligence". "Everyone keeps blaming us for not conducting proper inspections, but how can we do it if residential buildings are being used as labour camps without our knowledge," Al Dossary told the GDN. "This building in Mukharqa in which the workers were staying was an unregistered labour camp, details of which were not registered with the ministry. "How will the ministry and our labour inspectors know that this building is used as a labour camp if it's not registered with us. "The workers are putting their lives at risk by living in these old buildings." Ministry labour inspections manager and trade union director Ahmed Al Hayki said under the law labour inspectors could not enter residential buildings, which are often rented by low-income workers. "Our inspectors can only enter those labour camps and accommodations that are registered with us," he explained. "What we are seeing is to save money workers rent out bed space in old buildings and put their lives at risk." He urged foreign embassies and expatriate associations to play a bigger role in spreading awareness among their nationals about living in safe accommodations. "Landlords should also stop renting out properties that will be used for labour camps unless it is approved by us," he added. "And for the sponsors and companies, please register their workers' accommodation with us for their safety." Al Hayki said a ministerial task force has been actively working since last year to deal with unsafe and rogue labour camps which house thousands of workers. "We will continue with our labour inspections and inform bodies concerned of any violations," he said. Meanwhile, the Migrant Workers Protection Society (MWPS) yesterday launched an aid drive to help close to 50 survivors of the fire. MWPS chairperson Marietta Dias told the GDN that Bangladesh Embassy officials informed them that the survivors lost their belongings in the fire. "We are purchasing items which these workers are in urgent need and would like to appeal to the public to contact us for donations," she said. According to ministry figures, there are more than 3,000 registered labour camps in Bahrain, housing around 140,000 workers. Labour Minister Jameel Humaidan on Friday said that preliminary investigations revealed the building owner rented his property to an Asian worker, who further sub-let it to workers based on bed space available. According to the Labour Market Regulatory Authority's database the dead workers' employment visas were not valid. The gutted building was located in an area of the Manama Suq known locally as Bengali Gali, which has several labour camps, some of which are dilapidated and yet house thousands of low-income workers of different nationalities. The scene of the fire is also close to the area where 13 Bangladeshis died in a blaze that broke out in a rundown three-storey building on January 11 last year.